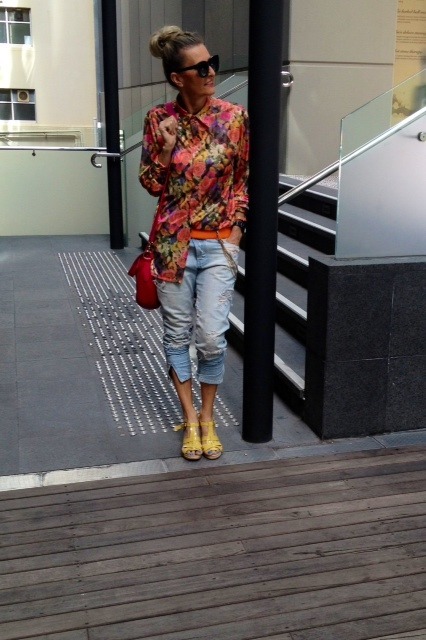 It’s a ‘Flower Power’ Spring season and this vintage, ‘Brave’ by Wayne Cooper shirt, shouted out ‘Fun-Fun-Fun’ from the racks at Vinnies!! 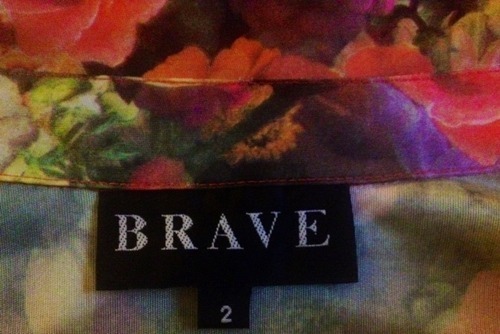 Wayne has recently re-invented his original label ‘Brave’, and it’s currently stocked at Myer. This shirt however is an oldy but goody. The faded, shredded, camilla & marc, boyfriend jeans above, are a wardrobe staple as they go with everything! Tip: On your next Opping trip, buy a $4 pair of washed out jeans. Have some fun and try your own DIY creation by fraying and ripping them! The shirt is buttoned all the way up and tucked, one side only. 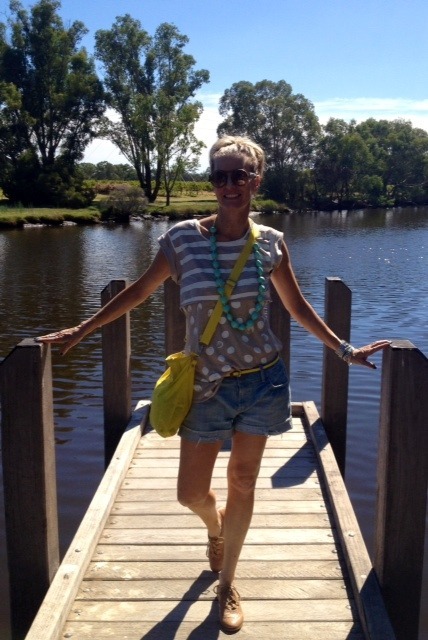 The Gorman daisy yellow clogs are perfect for walking!! 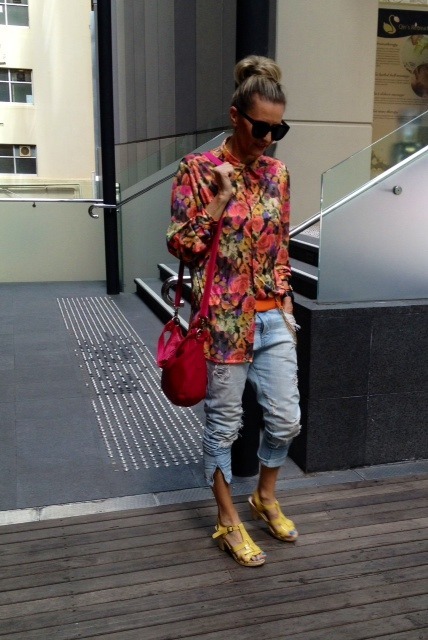 Karen Walker over-sized shades and Dangerfield pink pouch. Stunning! It was brekky date time at 140 William St with Daf from Cue this morning. Snap, snap, snap! She nailed it! Her Cue outfit…. tangello, zipper jacket, long-line shirt and black skinnies, was eye-catching. 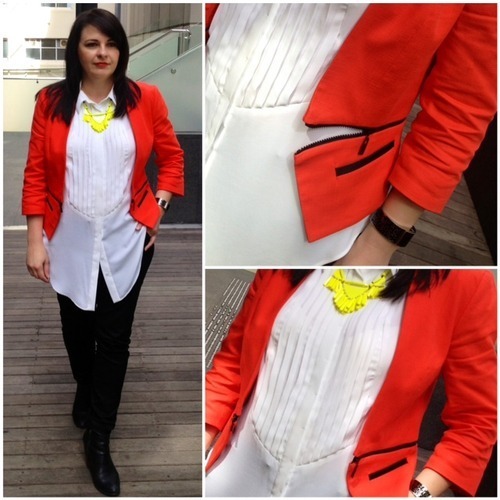 The lime fluoro necklet made her whole outfit pop!! The 2012 Perth Fashion Festival is just around the corner. Things are hotting up at Myer. Mariella, Director of PFF came in for some AndAndrea ‘jooshing’! Stylists Teagan and Ivanna, with intern Rachel above, were also in-store today. 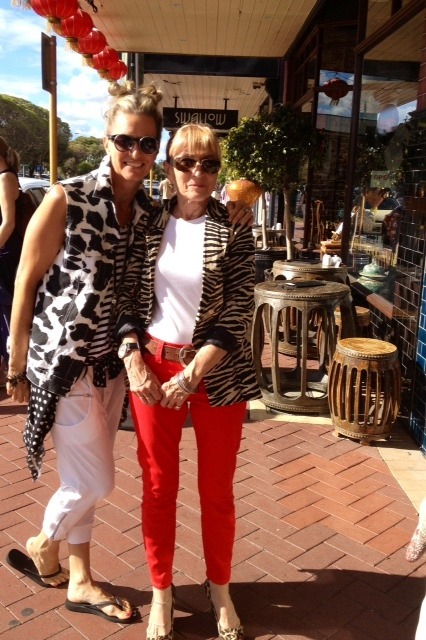 Teagan was prepping clothes for the Myer show and Ivanna was on the hunt for pieces for VIP guests….shhh! Just a sneaky lil peak of samples taken for the runway. Hot news!!! Myer VIP Nite is next Friday for all AndAndreastylistas!! Save the date: Sept 21st / 6pm at Myer Perth City. Bubbles, Designers, Models and more. Details to come.